I went out to the cliffs on the northern tip of the island the other day, to paint this funny old cable tower. There´s an electricity cable going from this place to the next island, and on the tower there´s a sign saying “Mind the cable” to prevent boat owners from anchoring there. The tower has been worn and torn by sunshine and storms, and it´s decay is slightly worse every year, but it is still such a beautiful landmark. 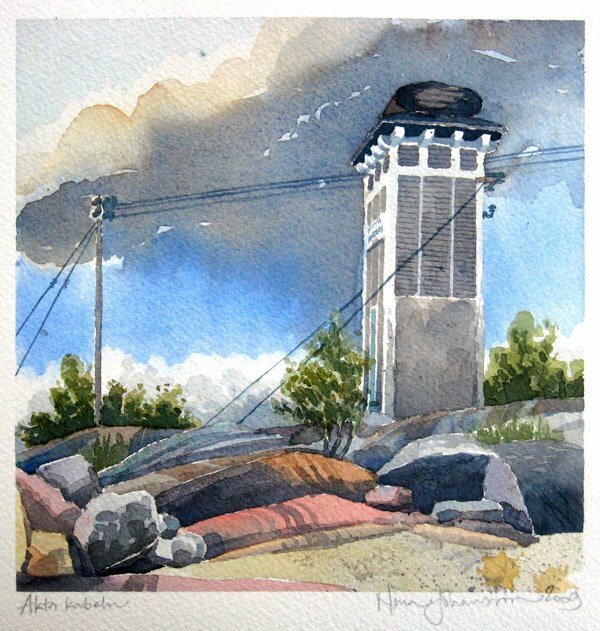 20 x 20 cm, pencil and watercolours on Saunders Waterford watercolour paper.